A young Owney Madden on his way up. His baby face hid a violent temper. Owen Madden was born at 25 Somerset St., in Leeds, England, on Dec. 25, 1891. His parents Francis and Mary (O’Neil), were also Leeds natives, but the search for work moved the family first to Wigan, then to Liverpool. Francis Madden had planned to take his family to the United States, but died when Owen, or "Owney," as he was called, was still an infant. In 1901, Mary Madden, still living her late husband’s dream to provide a better life for their children, sailed for New York aboard the RMS Oceanic. Once here, she moved in with her widowed sister, Elizabeth, at 352 10th Ave. Owen Madden, older brother, Martin, and younger sister Mary were left at a children’s home at 36 Springfield Terrace, in Leeds, until 1902, when Mrs. Madden could afford passage for them. Despite coming to America at a young age, Madden maintained a sentimentality for England throughout his life, refusing to give up his British passport until the 1950s, when he was threatened with deportation. He also maintained his Northern English accent and saved clippings from the Yorkshire Post until he died. On June 4, 1902, Madden, together with his brother and sister, sailed from Liverpool as steerage passengers aboard the SS Teutonic. Settling in New York’s infamous Hell’s Kitchen, Madden quickly saw the value - and need - to have the protection of a gang. He joined Gopher Gang, a large and violent group of Irish and English immigrants. Their biggest rival was the Hudson Dusters, and the two gangs were at constant odds for control of the streets. Described in early police records as "a banty little rooster," Madden quickly earned a reputation as a fierce fighter, known for his skill with a lead pipe or a gun. Madden earned his nickname, "the Killer," when he gunned down an Italian gang member in the streets, after which he allegedly shouted to witnesses, "Go ahead and call the cops! Owney Madden, 10th Avenue!" Despite the public nature of the murder, however, Madden made his point and no witnesses came forward. The story may not be true, but what is true is Madden’s quick temper and his propensity for violence. He could just as easily kill as he could negotiate. Rare photo of the Gopher gang. Madden is pictured in the back row, fourth from the left. 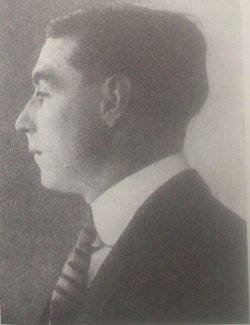 By 1910, at age 18, Madden was suspected in the deaths of at least five rival gang members, and his reputation for both violence and organization gained him leadership of one of the three factions of the Gophers. He was said to be earning as much as $200 a day from the gangs’ many criminal activities. Like most young gangsters, Madden enjoyed an opulent lifestyle, was often accompanied by several women and was known for his free spending. And like most people in his profession, he was also known for his excessive jealousy and possessivness. He even once shot a simple store clerk, William Henshaw, who made the mistake of asking out one of Madden’s girls. Although Henshaw died from his wounds, he lived long enough to name Madden as his assailant. Madden was arrested, but again his reputation saved him. The attack had numerous witnesses, but the case was dismissed when no corroborating witnesses came forward. Over the next three years, the Gophers reached the height of their power as Madden recruited more and more gunmen and fighters. But when Madden repeatedly encroached into rivals gangs’ territories, particularly the Hudson Dusters, he needed to be made an example of. On the afternoon of Wednesday, Nov. 6, 1912, as he was standing outside a dance hall at 52nd Street, several gunmen from the Dusters opened fire on him. Despite being hit by 11 bullets, Madden survived the attack. However, he refused to identify his attackers to police, telling them, "Nothing doing. The boys’ll get ’em. It’s nobody’s business but mine who put these slugs in me!" He spent several weeks in the hospital, but within a week of his release, several members of the Dusters were founded murdered around the neighborhood. In 1914, Madden was involved in yet another dispute with the Dusters, this time with Little Patsy Doyle, a ranking member of the gang, over a woman named Freda Horner. In a serious breach of gangland ethics, Doyle told police about Madden’s operations, and shortly after, Doyle assaulted Madden’s close friend, Tony Romanello. Madden was furious, and he vowed revenge and quickly arranged for Doyle’s murder. Madden relayed a message to Doyle through a friend of Freda Horner’s named Margaret Everdeane asking to meet him, supposedly in order to reconcile their differences. As Doyle arrived for the meeting on Saturday, Nov. 28, 1914, however, Madden ambushed and killed him. When police questioned Horner and Everdeane, they confessed to their roles in the incident. Finally, the police had solid evidence against Madden, who was quickly arrested, tried and sentenced to 20 years at Sing Sing. Behind bars or not, it was business as usual for Madden. In prison, he connected with old buddies from the Lower East Side, including Alessandro Vollero, Joseph Valachi and his old associate from the infamous Five Points Gang, Jimmy "the shiv" Destefano, who was the Sing Sing death house barber. Madden even managed to purchase former boxing champion Jack Johnson’s Club De Luxe, which he would reopen as The Cotton Club. Madden was paroled in 1923, after serving nine years, but he was released into a new world. The Gopher gang had broken up, and many members were either in prison or working for other gangs. Larry Fay, a former member of Madden’s street gang who had moved up to better things, offered Madden a job. Fay had a sharp criminal mind, but was not physically imposing and he needed Madden’s muscle to help establish the taxi business he had set up from profits he had made running Canadian whisky across the border. Fay employed a gang of strong-arm men to help him gain control of the most profitable cab-stands along Broadway and he put Madden in charge of that end of the business. Later, Fay moved in on New York’s milk trade, attempting to turn its delivery into a racket, and again put Madden in control. 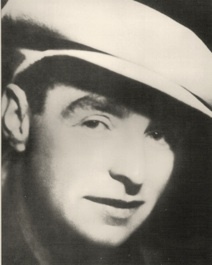 Fay had used Prohibition simply as a means to raise money for other ventures, but Madden saw Prohibition itself as a great opportunity, and soon became heavily involved in bootlegging, establishing a territory in the Hells Kitchen area. In 1924 the Madden gang began highjacking liquor shipments belonging to Big Bill Dwyer. A gang war seemed likely, but Dwyer reasoned a war would destroy what he had built and that allow other gangs to move in. Instead of war, he offered Madden a partnership. It was a wise move because it not only added considerable muscle to the enforcement side of his own operations, and Madden’s quick organizing skills allowed the operation to expand quickly. Madden appreciated the benefit of combining gangs, and he approached another former gang rival, George Jean "Big Frenchy" De Mange. The pair began to open or acquire some of the flashiest speakeasies and nightclubs in New York City. Madden and De Mange also refitted Johnson’s old Club De Luxe and renamed it The Cotton Club, a "Whites Only" nightclub serving vaudevillian-style black entertainment to the white patrons. But he wasn’t done yet. Madden, along with Dwyer and De Mange, muscled their way into a piece of the exclusive Stork Club, where the influential gossip columnist Walter Winchell held court and everyone who was anyone wanted to see and be seen. Madden eventually gained ownership of more than 20 clubs, and became well-known and glamorized for his Prohibition-era activities. He also gained recognition for his revenge tactics and payoffs of City Hall. 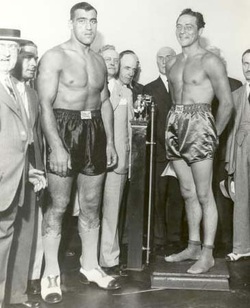 Carnera’s massive size is evident in the photo above, and the one below with Max Baer. 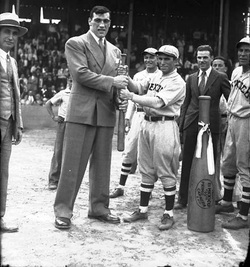 At right are Carnera, top, and Baer in their gentleman's finery. 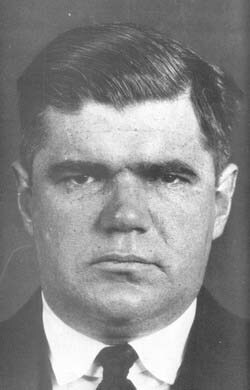 In 1932, Madden was allegedly involved in the murder of Vincent "Mad Dog" Coll, who had been extorting money from several mobsters, including DeMange and Madden. After being arrested for a parole violation that same year, Madden saw the end coming and, as he began facing greater harassment from police and encroachment on his territory by Italian Mafia families, he wisely left New York in 1935. Leaving behind racketeering, Madden settled in Hot Springs, Ark., which had become known as a haven for various criminals, with a corrupt city government and police force. Madden opened the Hotel Arkansas, a spa and casino in 1935, and also became involved in local criminal activities, especially illegal gambling. The Hotel Arkansas became a popular hideout for mobsters; Charles Luciano was apprehended there in 1935. Madden finally became a naturalized U.S. citizen in 1953, and eventually married Agnes Dempsy, the daughter of the city postmaster. He lived in Hot Springs until his death on April 24,1965, of natural causes. At the time of his death, Madden was said to have left $3 million in assets, the whereabouts of which remain a mystery to this day. Madden is buried beside his wife in Greenwood Cemetery, Hot Springs, Ark. Madden's stone, above, where he rests beside his wife. below is De Mange's tomb.